Jesus tells us that “every scribe who has been trained for the kingdom of heaven is like a master of a house, who brings out of his treasure what is new and what is old” (Matthew 13:52, ESV). I am what you might call a modern scribe: I am a translator and publisher of the Scriptures into the language of an unreached people in Chad. It is my job and privilege to handle “what is old,” the ancient and sacred writings passed down for millennia by prophets and priests, scribes and monks, publishers and translators. What a treasure it is! A fount of knowledge, the very words of God, life eternal, kept in the living storehouse of the Church. Jesus’ words also challenge me to bring out “what is new.” What “new” thing do God’s people have to offer? In Jesus’ day, it was his very body, the incarnate Word of God, little-baby-new Jesus himself. The Word always needs to be communicated to a new generation. Not altered or edited, but communicated afresh so that lost people as well as God’s people can see, touch, feel, and hear the salvation of God for them and receive it with their whole person. “What is new” is a gift to our creativity, as well as an awakening of our hearts to love others—whole persons—as Jesus does. How do we speak God’s Word to unreached people in a “new” and fresh way? This can only be answered through real and personal relationships with them. But the question is also relevant for how we go about our scribal work of Bible translation and publication. We have a precious few Christian friends who are working hard with us to produce God’s Word in their native tongue. The modern Chadian state functions in French—the jobs and the money are in French. So very little is written in the heart language of this unreached people. For this reason, we are producing this publication in their native tongue so that the presentation of God’s Word beckons a hearing of it. As of 2016, we have begun working on an illustrated edition of Genesis 1-3. No expense has been spared in this effort. As an alabaster jar of perfume poured on Jesus’ feet, we pray that this “new” addition would be a pleasant aroma, adorning the “old” and sacred Word. 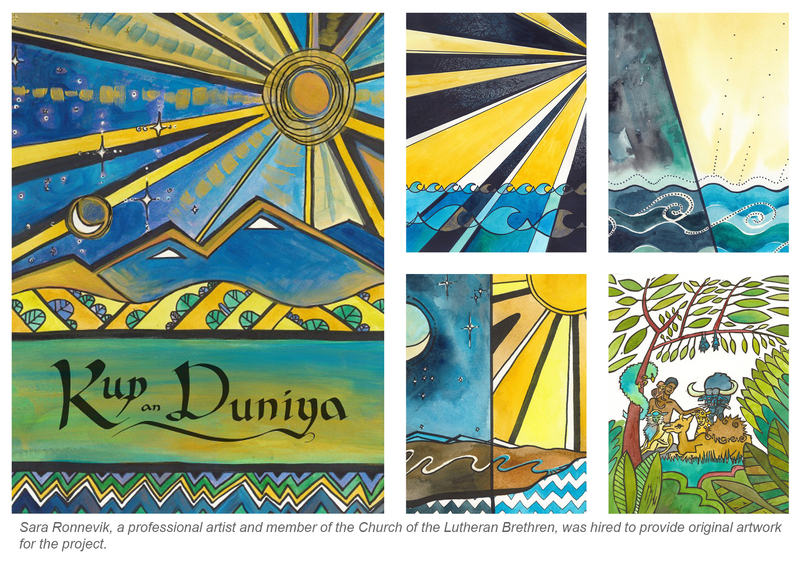 First, the illustrations are the original work of Sara Ronnevik, a member of the CLB and professional artist from Minnesota. She is as excited as we are to see God’s Word communicated to readers, to the illiterate, and to children in vivid color. Second, bucking a long trend in Bible translation, we have been willing to quadruple our printing costs in order to publish this edition in hardback. An ancient and precious treasure deserves a sturdy chest—especially in hot, humid Chad. This is likely the first and only book people will own; love compels us to give them the best we can. Third, we must consider the context: in this context sacred text is written by hand. So, at least for this first edition of Genesis 1-3, we are writing the text out in an easy-to-read calligraphy hand. But we’re not going to give up on a generation so easily! We have also committed to making this book accessible in as many ways as possible. We have already printed the text and illustrations of Genesis chapter one in a sturdy banner. It is unrolled like a scroll before an audience of friends as the story of Creation is revealed to them, paragraph by paragraph, one fish, bird and creeping thing at a time. They are transfixed, and I cannot wait to bring the rest of the story to them when it is completed. Additionally, we are publishing two editions of Genesis 1-3, one with the Latin alphabet that we all use, and one with the Arabic alphabet. A final stage in the project is to record an audio reading of the text, and combine it with the illustrations in a sort of video slide show. Cell phones have exploded onto the local Chadian economy. In their spare time people will sit around listening to any audio material that they can obtain and pass around with Bluetooth. With such a medium, God’s Word will spread all on its own. Does the effort and expense sound overwhelming? Believe me, to be entrusted with such a treasure is pure joy. 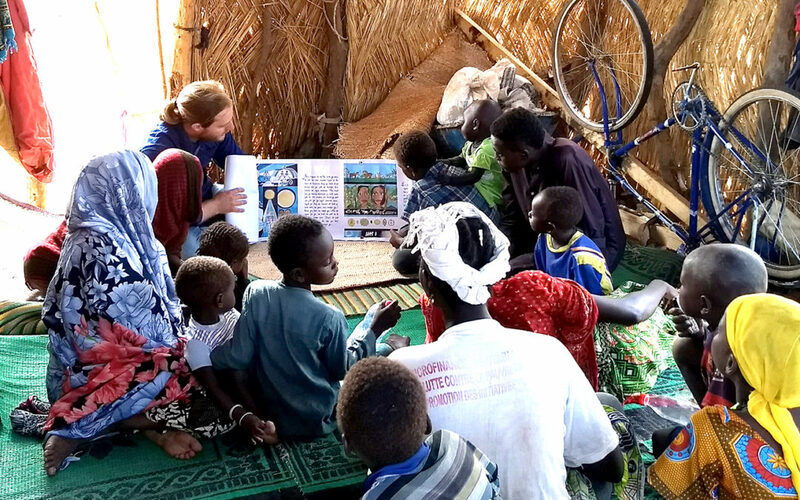 Nathanael S. serves Lutheran Brethren International Mission with his wife Carrie and their four children as missionaries to the unreached people of Chad.